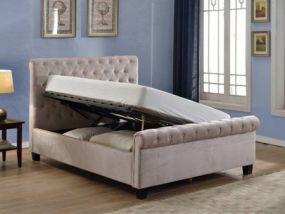 At Bedz 'R' Us, we believe that a double bed shouldn't just be exceptionally stylish, but functional too. 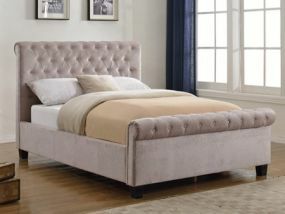 That's why our Flair Furnishings double bed range includes side and end lift Ottomans with discreet storage. These incredibly popular double beds are also the perfect size for a couple to snuggle up and enjoy a really good night's sleep thanks to the comfort of the slatted bases. Available in chic mink, a warm neutral, or stylish silver to make a real design statement, our Flair Furnishings double beds are fully upholstered and feature button detailing and high headboards that are always on trend. Whether you enjoy a lazy Sunday breakfast in bed, or you like to bounce out of bed in the morning feeling refreshed, our range of double beds delivers. Featuring timeless and stylish designs, including sleigh beds, plus free delivery on selected models, there's never been a better time to treat yourself to a fabulous Flair Furnishings Double Bed.